QualityPrescriptionDrugs encourages open communication and access to our health professionals. If you have any questions about the use or safety of your medications, please call our toll-free HealthLine at 1-877-244-0429. 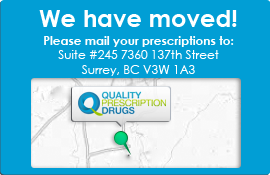 QualityPrescriptionDrugs is licensed in the province of British Columbia by the College of Pharmacists of British Columbia. License #X23. Copyright © 2019 QualityPrescriptionDrugs. All rights reserved. "QualityPrescriptionDrugs" and "qualityprescriptiondrugs.com" are registered trademarks used under exclusive license by QualityPrescriptionDrugs. All rights reserved.